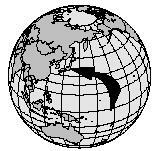 Japan is an archipelago (chain of islands) made up of about 3,000 islands. 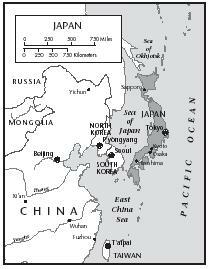 About twothirds of the land is too mountainous for development, so almost all the people live in cities, most of which were built on the country's flat land (plains area). The country sometimes experiences natural disasters, such as typhoons (huge storms originating over the ocean) and earthquakes. Some mountainous areas have been terraced (had step-like areas cut into them) to allow farmers to grow rice and other crops. The climate is good for farming, with rice being the chief crop. About half of Japan's arable land (land able to be farmed) is devoted to growing rice. 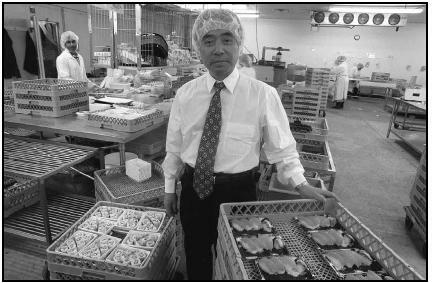 From the 1970s to the 1990s, the production of Japan's livestock farmers doubled. Japan accounts for about 8 percent of all the fish caught in the world. Japanese people consume large amounts of fish. Each person in Japan eats more than 150 pounds of fish per year, or around three pounds of fish per week. Wash the rice and allow it to soak in a saucepan for about 30 minutes; let drain. Return the rice to the saucepan, add water, and bring to a boil over high heat. Reduce heat, cover, and let simmer, cooking about 15 minutes more until water has been absorbed by the rice. Reduce the heat to medium and keep covered, allowing rice to steam for about 15 minutes. Serve in individual bowls with chopsticks (optional). Serves 4. To eat rice, the rice bowl is held in the left hand, close to the mouth. The chopsticks are used to push the rice into the mouth as the bowl is slowly rotated in the hand. Place a sheet of nori (dry seaweed), shiny side down, on the makisu (bamboo mat). Wet your right hand (or left hand, if you are left-handed) in the bowl of vinegar water, and use it to scoop up a ball of rice. Spread the rice out in an even layer on one side of the nori . Sprinkle a line of wasabi (horseradish powder) down the center of the rice. Arrange the strips of vegetables and seafood over the line of wasabi . Using the mat to support the nori , lift one end of the mat to gently roll the nori over the rice and other ingredients. Use gentle pressure to compact the rice and other ingredients so that they hold together. Continue rolling until a long cylinder is formed, completely encased in nori . Carefully slice through the nori and other ingredients to make the bites of sushi . Serve immediately so the nori will still be crispy. 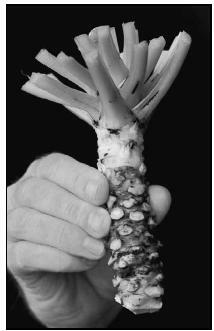 Wasabi powder, a key ingredient in sushi, is produced from the wasabi root. Cook rice according to directions on package. Allow to cool slightly. Have a bowl of lukewarm water handy. Dip clean hands into water, and then sprinkle salt on wet hands. Place a small mound of rice (about 2 Tablespoons) in the palm of your hand. Press a piece of pickled plum or cooked salmon into the mound of rice. Toss the mound back and forth between wet, salted hands to form a triangular mound, with the filling item in the center. Wrap mound in a dry seaweed strip. Wash the scallions and cut the green parts into 1½-inch lengths. Cut the tofu into small cubes and place the scallions and tofu in soup bowls. Boil the dashi (broth) in a saucepan. Put a little of the boiling liquid in a bowl and mix with the miso . Pour back into the saucepan, then ladle into the soup bowls. Mix soy sauce, sugar, and dashi or broth in a bowl and set aside. Arrange beef and vegetables on a large platter. Heat an electric skillet 300°F; or heat a frying pan over medium-high heat. Add oil and heat. Add the meat and brown for 2 minutes. Add the vegetables and the tofu, including the bamboo shoots, placing each on its own part of the skillet. Add the sauce and cook mixture for 6 to 7 minutes, turning gently to prevent burning and keeping all ingredients separate from each other. Serve at once over rice. Combine soy sauce, sugar, gingerroot, and sesame seeds in a large bowl. Place chicken in a baking dish and pour sauce over it. Bake for 45 minutes. Turn chicken about every 15 minutes, coating with sauce in the process. Soak mushrooms in a bowl of warm water for 30 minutes. Dry mushrooms. Cut off stems and discard. Slice mushrooms thinly. Bring 3 quarts of water to a boil in a large pot and add ramen . Cook 1 to 2 minutes or until tender yet firm. Rinse ramen ; drain well. Toss with 1 Tablespoon of the oil; set aside. Heat remaining 2 Tablespoons oil in a wok or large skillet over medium to high heat. Add onion and gingerroot and stir-fry for 2 minutes. Add cabbage and mushrooms; stir-fry 3 minutes. Sprinkle with mirin . Stir-fry 1 minute more. Add ramen ; toss until hot. Season with soy sauce, pepper, onions, and salt. Shrimp, ham, chicken, or other tempura can be added. The most important holiday in Japan is the New Year, Shogatsu. Special holiday foods, called osechi , are prepared in beautifully decorated stackable boxes called jubako. Each layer of the box has compartments for several different foods. Glazed sardines, bamboo shoots, sweet black beans, and chestnuts in sweet potato paste are just a few of the many holiday foods. New Year foods are also eaten because they are believed to represent good fortune or long life. At New Year's, children are especially fond of hot rice cakes dipped in sweet soybean powder. The Girls' Festival (or Doll Festival) is held in March. Dolls are dressed in traditional Japanese dresses called kimonos and are offered rice crackers, colored rice cakes, and a sweet rice drink called amazake . Everyone in the family eats the foods. Festive foods for Children's Day (May 5) include rice dumplings stuffed with sweet bean paste. Broil the mochi cakes under a hot broiler on all sides until the cake is crisp and brown, but not burnt. Remove from heat, piece with a fork, and set aside. Dip the chicken slices into salted boiling water for 2 minutes, then drain. Bring the dashi to a boil in a saucepan, then add chicken pieces and simmer until tender. Ladle ½ cup of dashi into the miso and whisk until blended. Pour back into the soup and bring just to a boil, then remove from heat. Place a cooked rice cake in the bottom of each of 4 bowls, then ladle the soup over them, distributing the chicken pieces evenly. Top with slivered leek. Place tops on the bowls, and serve immediately. Rice cakes are a popular dessert for both New Year's and Children's Day. These may sometimes be purchased at Asian markets or specialty grocery stores. In a medium-size bowl, combine rice flour, salt, and brown sugar. In a blender or food processor, grind peanuts until they form a paste. Add the water; process until blended, scraping sides of container once or twice. Pour peanut mixture into rice-flour mixture. Stir to form a stiff dough. Lightly knead dough about 30 seconds. In a wok or deep pot, bring 4 cups of water to a boil. Spread a piece of dampened and unbleached muslin or several layers of cheesecloth over a steamer tray. Spread the dough evenly over the cloth, about ½-inch thick. Place the steamer into the pot, over the boiling water. Cover and steam for 20 minutes. Remove tray from pan and lift out cloth with dough. Pull away cloth, dropping dough onto a flat surface dusted with potato starch or cornstarch. Cool 2 minutes. Knead 1 minute or until smooth and shiny. Roll dough into an 8-inch long sausage roll and cut into 8 equal pieces. Dust lightly with cornstarch to prevent sticking. Form into smooth, round shapes. Drizzle rice cakes with honey and roll in soybean powder. Serve on small plates with cups of hot green tea. Food is grasped between chopsticks and lifted to one's mouth. Chopsticks should never be stuck into a piece of food or used to pass food back and forth. It is not considered impolite to sip one's soup directly from the bowl. At a Japanese meal, people at the table fill each other's drinking glasses but never their own. The Japanese do not eat while they are doing other things, such as walking or driving. A Japanese car company once claimed that some of its seatbelts didn't work properly in the United States because Americans spilled so much food in their cars. They believe people should not eat and drive cars at the same time. Cut chicken into bite-sized chunks. Wash leeks, remove the roots, and cut into ¾-inch lengths. Slide the chicken and leeks onto bamboo skewers. In a bowl, mix the sugar and soy sauce together. Spoon a little of this mixture over the chicken skewers. Turn the skewers over, spoon on some more sauce, and cook for 5 more minutes. Serve hot and eat with your fingers. 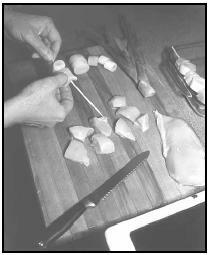 Thread pieces of chicken and slices of leek onto bamboo skewers. The skewers should be soaked in water for at least thirty minutes before using. Make soup according to package directions. Place up to four of the add-ins into a large soup bowl. Carefully pour hot broth and noodles over vegetables. Use chopsticks to eat the vegetables and noodles, and drink the broth from the bowl. Place salmon under broiler for 5 minutes each side. Mix soybean paste, sugar, soy sauce, and sake (or vinegar) together in a bowl. Spread mixture on salmon steaks and broil another 2 minutes per side. Garnish with the sliced green onions and serve immediately. Beatty, Theresa M. Food and Recipes of Japan. New York: PowerKids Press, 1999. Cook, Deanna F. The Kids' Multicultural Cookbook: Food and Fun Around the World. Charlotte, VT: Williamson Publishing, 1995. Ridgwell, Jenny. A Taste of Japan. New York: Thomson Learning, 1993. Slack, Susan Fuller. Japanese Cooking for the American Table. New York: Berkeley Publishing, 1996. Weston, Reiko. Cooking the Japanese Way. Minneapolis: Lerner, 2001. This fresh sushi produced at this factory in Queens, New York, meets the growing demand for sushi in restaurants and supermarkets across the United States. Schauwecker's Guide to Japan. [Online] Available http://www.japan-guide.com/r/e1.html (accessed August 17, 2001). Tokyo Food Page. [Online] Available http://www.bento.com/tf-recp.html (accessed August 17, 2001). Asia Foods [Online] Available http://www.asiafoods.com (accessed August 17, 2001). The Oriental Pantry 423 Great Road (2A) Acton, MA 01720 (978) 264-4576 [Online] Available http://www.orientalpantry.com (accessed August 17, 2001). Specialty Orient Foods, Inc. 43-30 38th Street Long Island City, NY 11101 Toll free: 1-800-758-7634 [Online] Available http://www.sofi-ny.com/mail_order/english/mail_order_main_e.htm (accessed August 17, 2001).